I can’t believe that 2018 is here already and it’s time to post my top 20 list of best strollers again! Where did the year go?! I feel like it’s getting harder and harder each year to keep my list down to only 20 models because there are so many new brands and models that I want to share with you. It’s always a choice between something new and exciting that haven’t been tested yet or the updated popular models that have been around for years. I would probably go with updated oldies but goodies because for me the quality of the stroller is THE most important feature and since the model has been around for a long time there are tons of reviews from parents and the company has already worked out all the bugs. As you know, I usually do stroller reviews on my site. 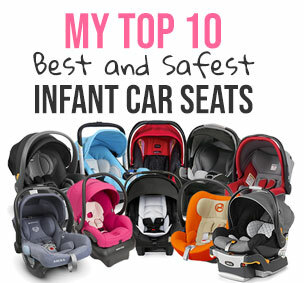 But, since I’ve been getting so many emails asking how to pick the best and safest infant car seat for each stroller, I decided to post a list of my top 10 favorite infant car seats. When I rate a car seat, I look at crash ratings, safety features, ease of installation and overall comfort. The price is a little less important to me since you can find a safe car seat in any price range. While ALL car seats, even the cheapest, are very safe, more than 70% of them are installed incorrectly. Can you believe it? More than 70%!!! This is a scary number. So, ease of installation is an important feature.